On 17 May 2016, the World Head of the Ahmadiyya Muslim Community, the Fifth Khalifa (Caliph), His Holiness, Hazrat Mirza Masroor Ahmad delivered the keynote address at a special reception held to mark his first ever visit to Sweden’s capital, Stockholm. Over 60 dignitaries and guests, including various Members of Parliament attended the evening reception, which took place at the Sheraton Hotel in Stockholm city centre. 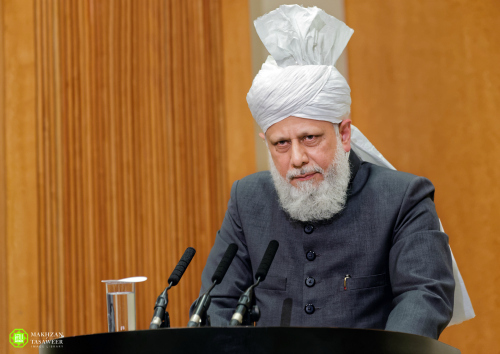 During his address, Hazrat Mirza Masroor Ahmad spoke in detail about the refugee crisis that has caused uncertainty and instability to spread in Europe during the past year. Whilst praising the Swedish Government for its “generosity” in accepting tens of thousands of refugees, His Holiness said it was essential that the refugees remained loyal to their adopted nations and sought to contribute to society as soon as possible. His Holiness also called on the United Nations and major world powers to act with justice and to strive for true and long-lasting peace in the world. His Holiness said that refugees should not be given preferential treatment over local citizens as this could lead to resentment and frustration amongst the wider society. His Holiness also called on Muslim clerics to play a responsible role in guiding refugees about Islam’s true teachings. Later in his address, His Holiness quoted extensively from the Holy Quran to refute allegations that Islam permitted any form of extremism or compulsion in matters of religion. His Holiness also quoted chapter 23, verse 9 of the Holy Quran, which calls on people to fulfil their pledges and trusts. His Holiness said that he considered this to be a “universal principle” for all people and nations. His Holiness concluded by reiterating his fears that the world was moving away from God Almighty and closer to a destructive world war. Earlier in the evening a welcome address was given by the National President of the Ahmadiyya Muslim Community in Sweden, Mr Mamoon-ur-Rashid, followed by guest remarks from Swedish Parliamentarians. 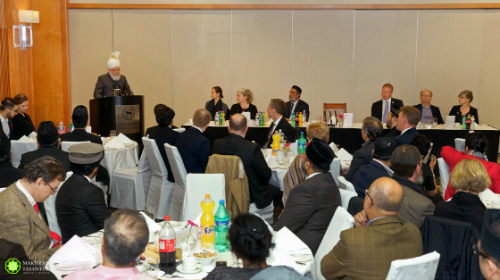 The event concluded with a silent prayer led by Hazrat Mirza Masroor Ahmad and later His Holiness personally met with the guests. Share the post "Head of Ahmadiyya Muslim Community addresses refugee crisis during historic address in Sweden"